This short documentary about the circumstances surrounding the taking of the famous Earthrise photo is pretty fascinating. Because the video includes very precise time/position information I tried to recreate it using Space Engine. Unfortunately I couldn't get a perfect match, I had to adjust the latitude a little and the longitude a lot (roughly equivalent to skipping ahead in the orbit a bit). But what I got after a little fudging is damned close to the actual photo. Notice the Earth is in exactly the right orientation, with Africa on the terminator. And here is the same picture with position information. If you want to cut and paste the saved location, use this. I think that works, I've never done it myself. Place "Apollo 8 Earthrise - yet another approx"
That's pretty cool, and the end product is close too. Unfortunately I couldn't get a perfect match, I had to adjust the latitude a little and the longitude a lot (roughly equivalent to skipping ahead in the orbit a bit). SpaceEngine currently has a simple Keplerian orbit for the Moon whereas in reality the orbit is extremely complicated. 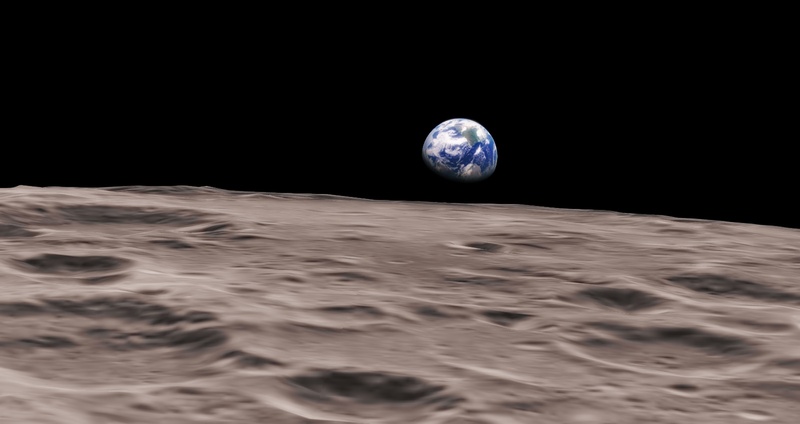 So in recreating Earthrise, the Earth should be in the correct position and orientation but the Moon will be off a little bit, hence the fudging required. It would be neat to try this in Orbiter too, since it had a more accurate treatment of its orbit. Oh, neat! I figured it was something like that. Amazing that it came out so close anyway.